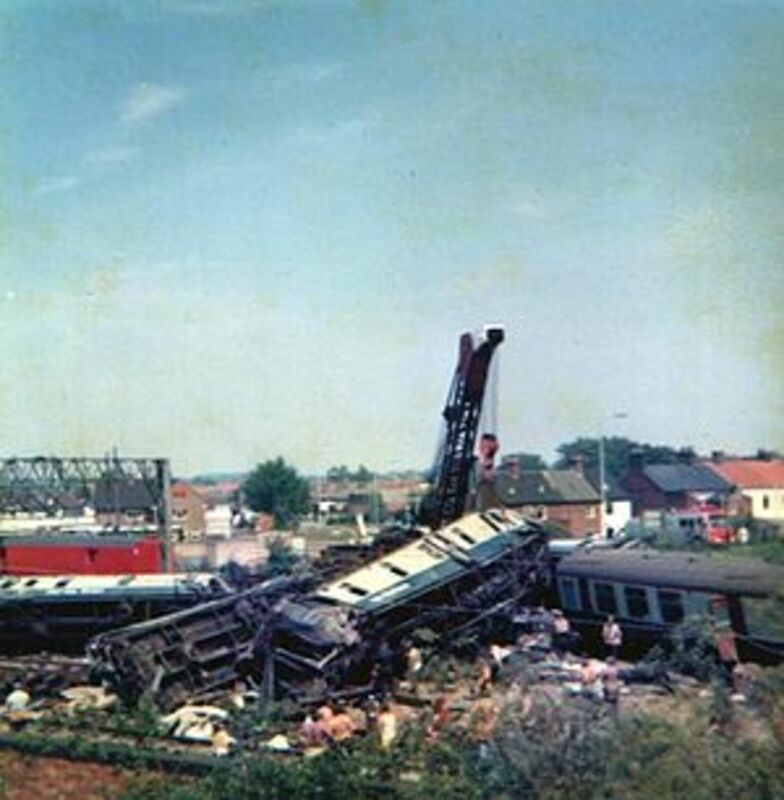 There have been hundreds of rail accidents in the British Rail History. 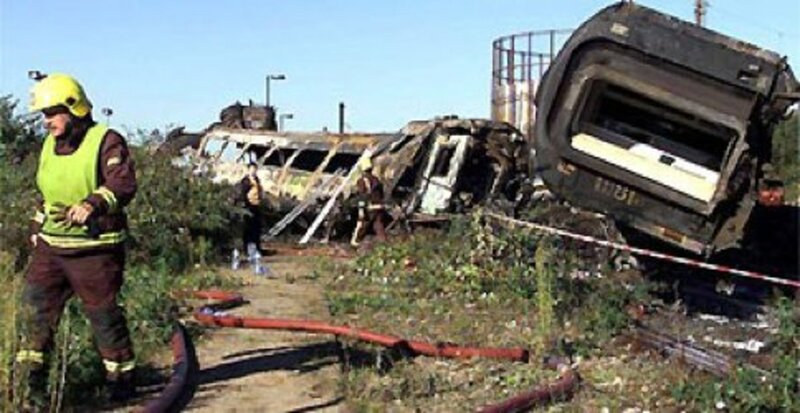 Below is a compilation of the worst rail accidents which were caused due to various reasons. 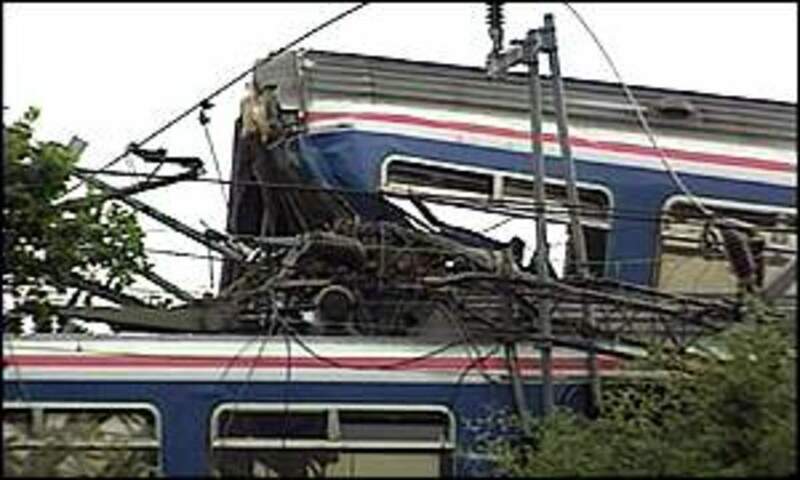 On 10 May 2002, a railway accident occurred when a northbound train derailed at high speed. Part of the train ended up wedged between the station platforms and building structures. A West Anglia Great Northern train service left King's Cross station at 12:45 bound for King's Lynn in Norfolk, via Cambridge. At 12:55, travelling at 97mph, the four-car Class 365 electric multiple unit (unit number: 365526) crossed over a set of points '2182A' just south of Potters Bar railway station. 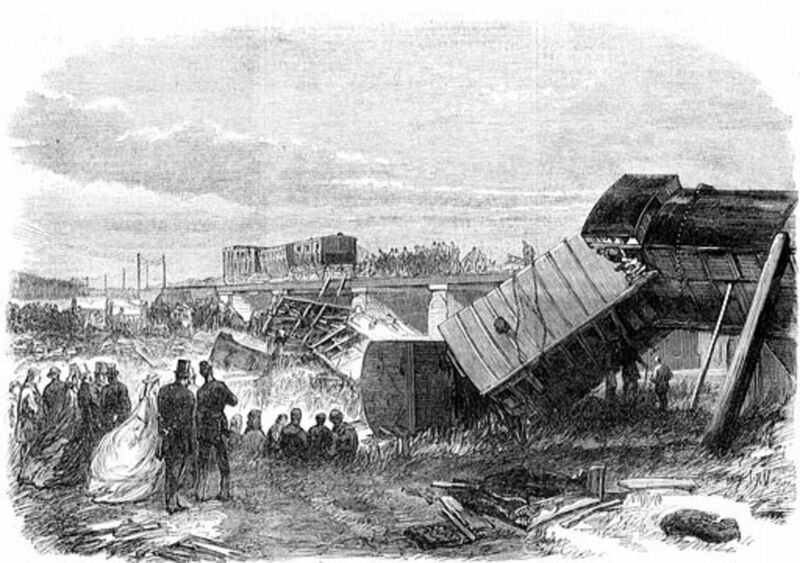 As the final coach travelled over the points, they failed, and this caused the rear wheels of the carriage to travel onto the adjacent line and ultimately derail, flipping it into the air. The momentum created carried the carriage into the station. One end of the carriage struck a bridge parapet, sending debris onto the road below. It then mounted and slid along the platform before coming to rest under the platform canopy at 45 degrees. The front three coaches remained upright, and came to a stop to the north of the station. 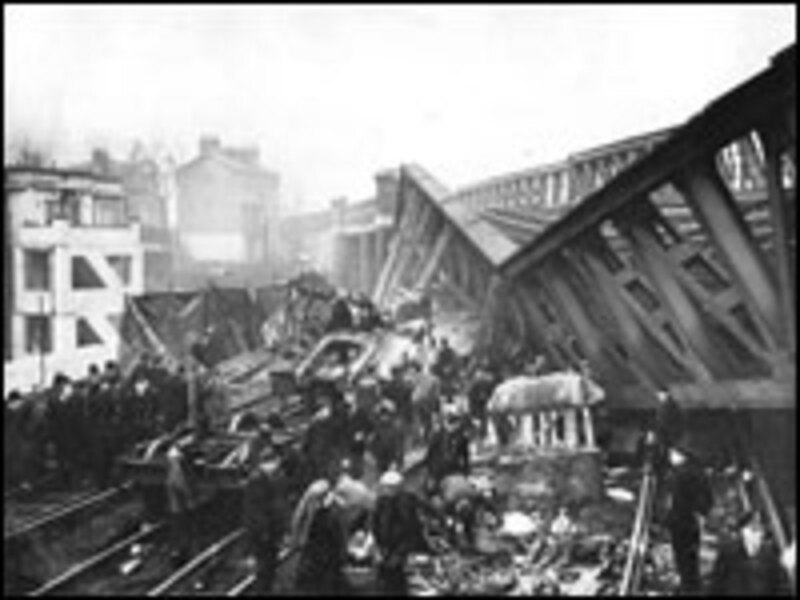 Six of the victims were travelling on board the train, while a seventh, Agnes Quinlivan, was killed by masonry falling from the bridge over Darkes Lane. On Wednesday 28 February 2001, the 04:45 Great North Eastern Railway passenger train left Newcastle on route to London Kings Cross. At approximately06:12, a Land Rover pulling a trailer loaded with a Renault car left the west bound carriageway of the M62 motorway at Great Heck, between junctions 34 and 35. The Land Rover and trailer continued along the steep road embankment and subsequently down a railway embankment and came to rest, fouling the Up mainline, on the south side of the M62 over-rail bridge at a point located at about 170 miles from London up the East Coast Main line. The road vehicle driver survived the incident and made a telephone call to the emergency services. As he was talking to the emergency services, the south bound GNER express passenger train struck the Land Rover. 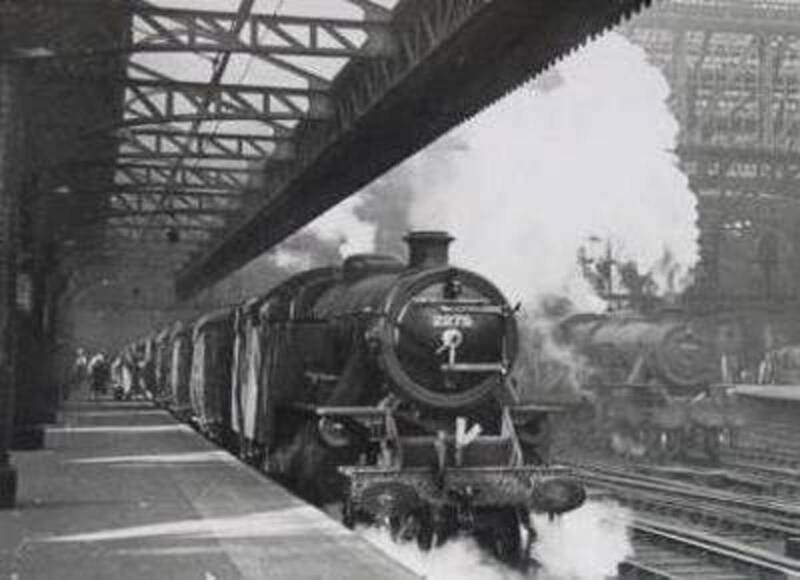 The train, which was travelling at around the line speed of 125mph, and consisted of a leading Driving Van Trailer, eight Mark IV passenger carriages, and a buffet car. 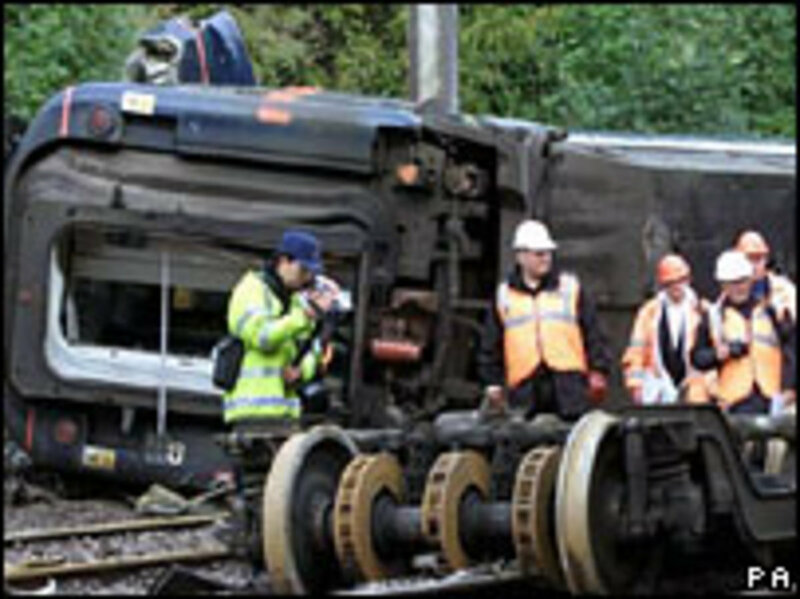 The DVT became derailed at a point approximately 15 metres to the south of the impact and then travelled in a derailed condition, staying substantially in line and upright, for approximately 700 metres until it reached a set of points associated with sidings. A GreatNorthEasternRailway InterCity225 train bound for Leeds had left LondonKing'sCross at 12:10. 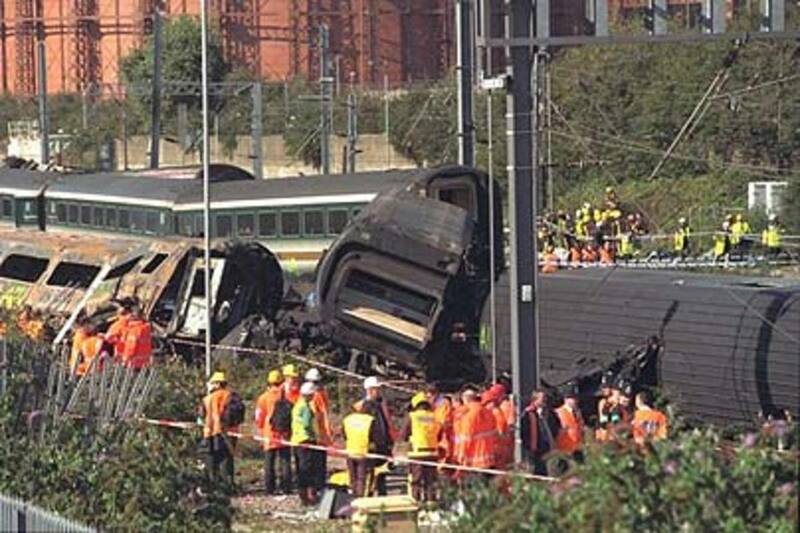 It was travelling at over 115 miles per hour (185 km/h) when it derailed south of Hatfield station at 12:23. Four passengers were killed and a further 70 injured. Those killed were in the restaurant coach which struck an overheadline gantry following derailment. The cause of the accident was due to the fracture and subsequent fragmentation of the high rail over a 35 metre length due to substantial transverse fatigue defects in the rail head. It states that these defects had their origins in gauge corner cracks, a form of rolling contact fatigue, which had developed on the rail surface. 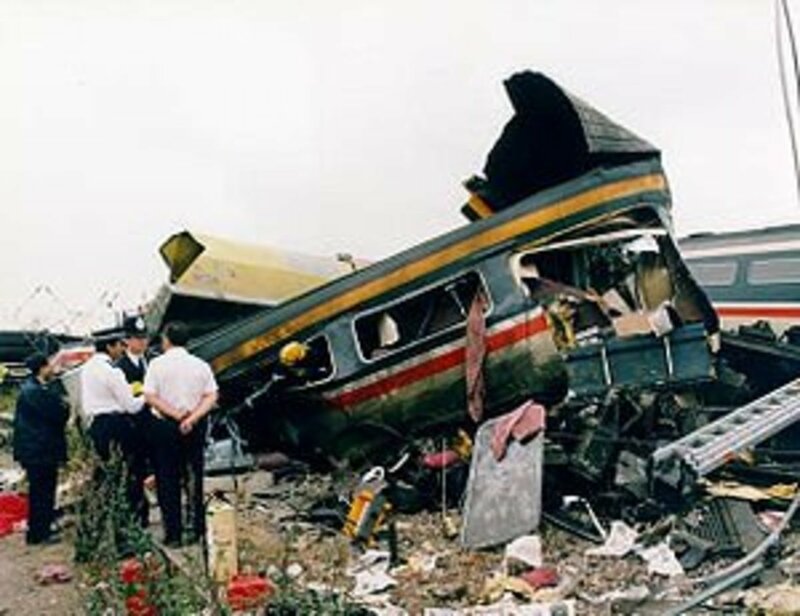 The disaster occurred at at 08:08 and 58 seconds BST, when a three-car diesel multiple unit train operated by Thames Trains collided with a High Speed Train (8 coaches with a diesel power car at each end) of First Great Western at Ladbroke Grove Junction about two miles / 4km west of London Paddington Station. 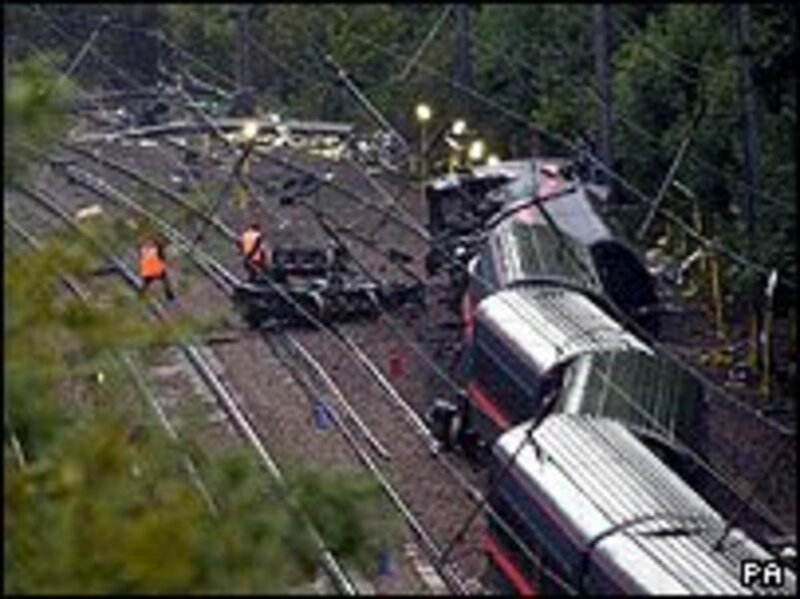 The trains collided almost head-on on the junction at a combined closing speed of approximately 130 mph / 205 km/h. 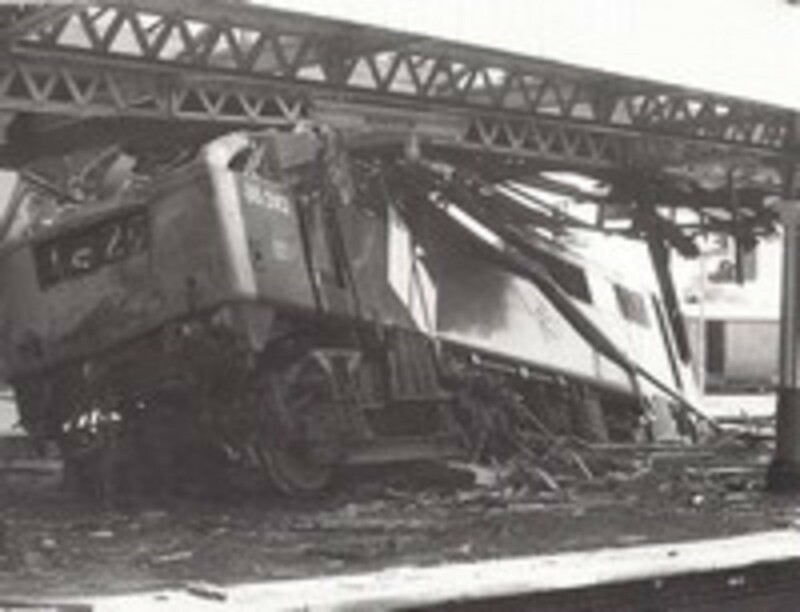 The first car of the Thames Train, the 0806 from Paddington to Bedwyn, Wiltshire, driven was totally destroyed in the impact, and the diesel fuel carried by this train at the start of its daily journeys ignited causing a series of fires in the wreckage, particularly in coach H at the front of the HST, which was completely burnt out. 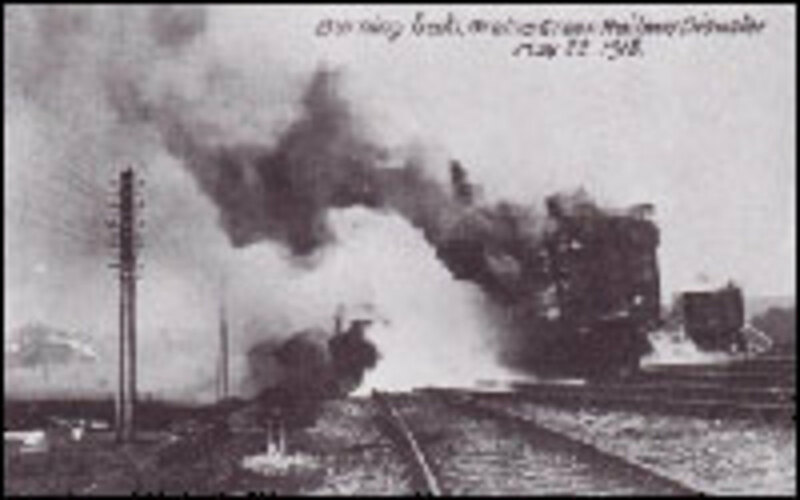 31 people were killed in the disaster, including the drivers of both trains, and some 400 were injured, some very seriously. The of the disaster was identified as being due to Driver passing signal when it was showing a red signal (technically known as a SPAD - Signal Passed At Danger), at a point 563 metres before the impact point. 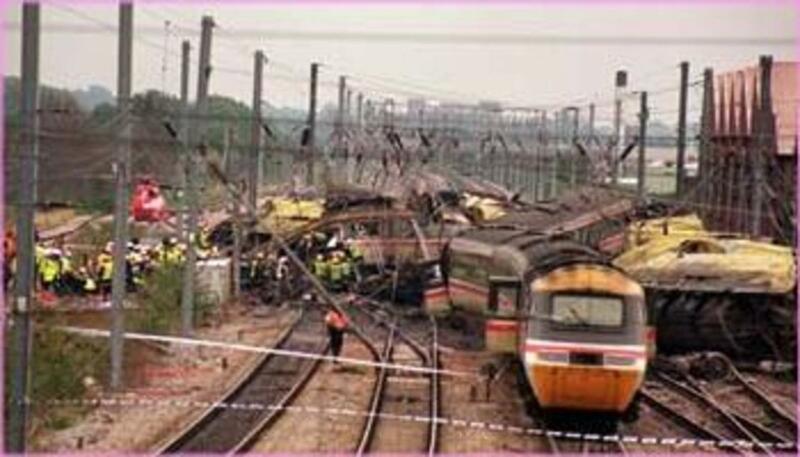 On 23 June 1999, a VirginTrains electric express train from LondonEuston to GlasgowCentral ran into an empty four-carriage Pacer unit, injuring 31 people. The express had been travelling at about 110 mph, but driver Roy Eccles noticed the Pacer on the line and was able to decelerate to about 50 mph at the time of impact. Eccles was awarded a medal for his prompt action, which averted a much more serious accident. The Pacer had passed a signalatdanger and run through a set of points, coming to a stand on the line on which the express was approaching. 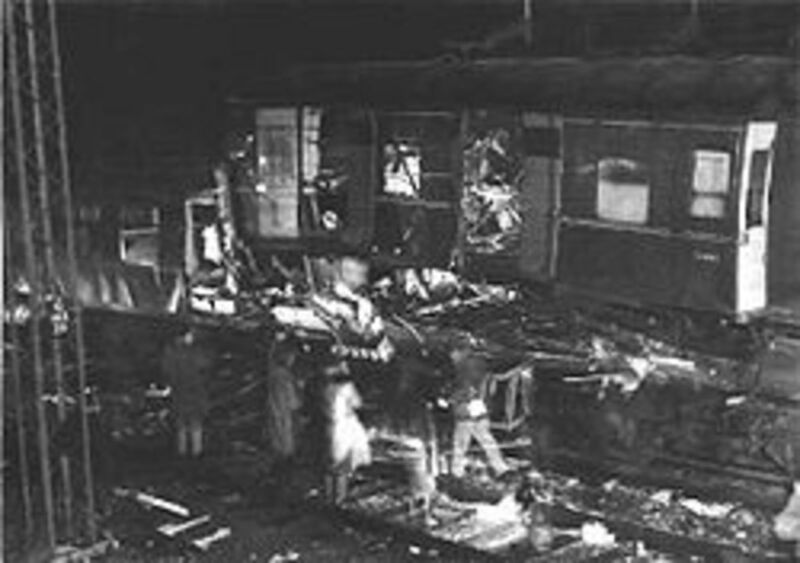 Its rear cab was destroyed in the crash along with a section of the passenger accommodation, and the coach bodies were displaced from their underframes. The collision took place on Railtrack owned infrastructure at Winsford South Junction just south of Winsford station in Cheshire. 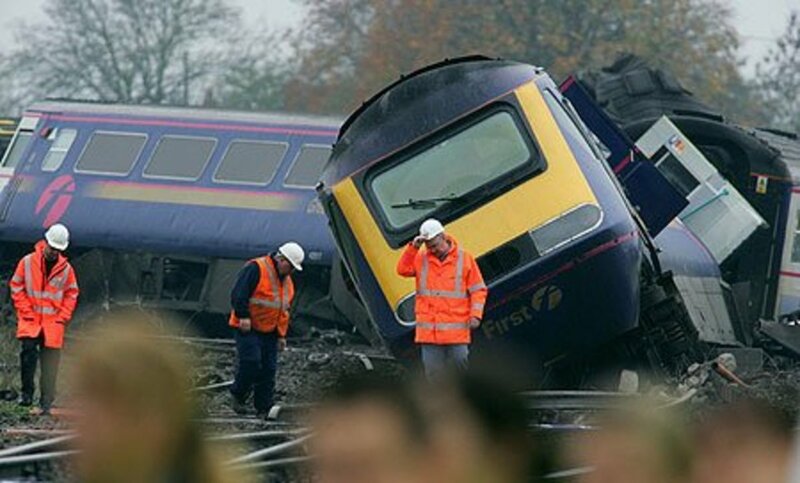 The crash occurred after the 10:32 Great Western Trains Intercity passenger train from Swansea to London Paddington, worked by power cars 43173 + 47163 and operating with a defective Automatic Warning System (AWS), went through a red signal (SPAD) and collided with a freight train leaving its depot shortly before 13:20 local time. If the AWS equipment on the High Speed Train (HST) passenger train had been working, the chance of the accident occurring would have been very substantially reduced, though not completely eliminated, since the AWS is only an advisory system. The driver's attention had been distracted and he did not observe the preceding signals visually but AWS would have given him a clear audible warning. Automatic train protection equipment would have almost certainly prevented the accident. The train was fitted with ATP but this was also switched off. At the time of the accident, the ATP equipment was not required to be switched on and had proved troublesome in service, and drivers were not required to be trained on it. Following this accident and the Ladbroke Grove rail crash, the train operating company First Great Western now requires all its HST trains to have ATP switched on (if the equipment is faulty the train is taken out of service). 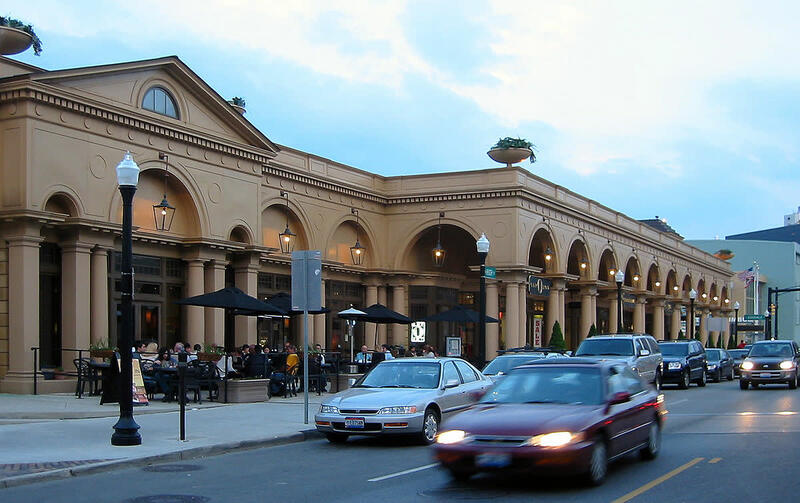 The driver was initially charged with manslaughter but the case was dropped. 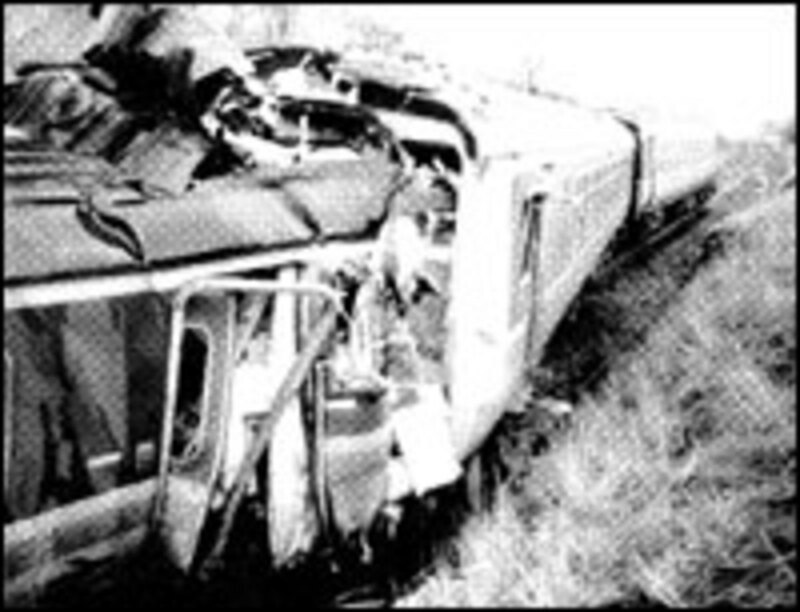 A collision occurred between two trains approximately 700 m south of Watford Junction station on the West Coast Main Line at 17:24 on Thursday 8 August 1996. 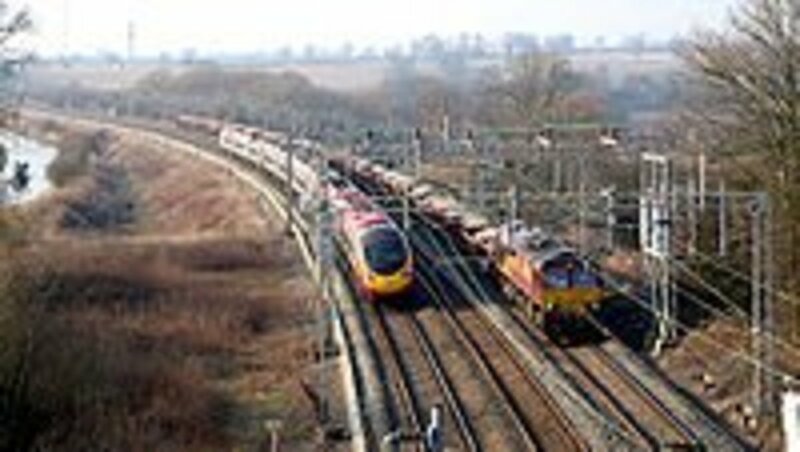 A northbound passenger train that had left London Euston station at 17:04 and was travelling along the Down Slow line was struck by a southbound ECS train that was progressing across the connections linking the Up Slow to the Up Fast lines. The ECS train was traversing the crossover linking the Down Slow with the Up Fast when the collision occurred. A Class 156 Super-Sprinter formed the 1626 Carlisle to Leeds via Settle service. It could only proceed as far as Ribblehead railway station, about 12 miles north of Settle, as the lines from Ribblehead to Settle were blocked by flooding; so it had to return to Carlisle. The driver changed cabs as the train was now heading northbound instead of southbound, and proceeded back over the Ribblehead Viaduct, and on to Aisgill Summit, the highest point on the line at 1169ft above sea level. It was dark and raining heavily. Near Aisgill Summit itself the train hit a landslide. It derailed across both tracks, and the cabin lights went off plunging it into darkness. The injured driver managed to make an emergency radio call to Crewe Control Room telling them of the incident. 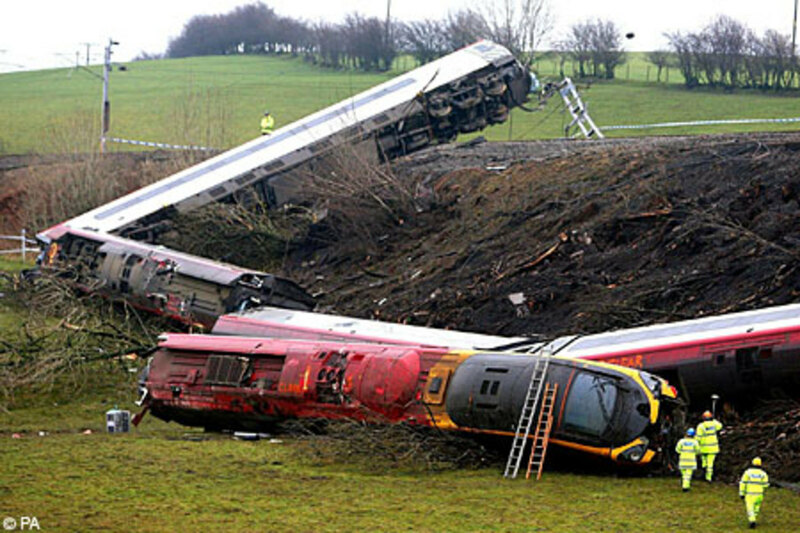 Unfortunately the actions at Crewe and York Control Rooms did not prevent the subsequent collision. 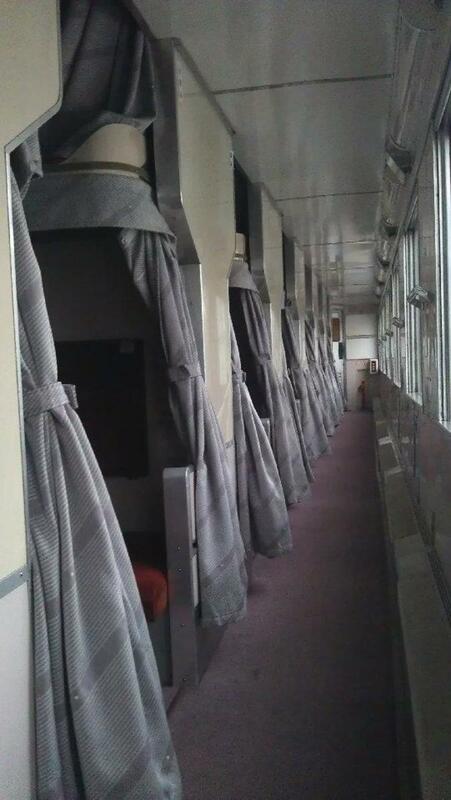 The conductor escorted passengers into the rear unit, which was across the northbound track. He then returned to see the driver who was still in the cab. Meanwhile another Super-Sprinter train forming the 1745 Carlisle to Leeds service (headcode 2H92) had set off from Kirkby Stephen railway station around five miles to the north. About a quarter of a mile before the derailed train, the driver saw its red headlights and started to make an emergency brake application, but the train had no chance of stopping before impacting the derailment. 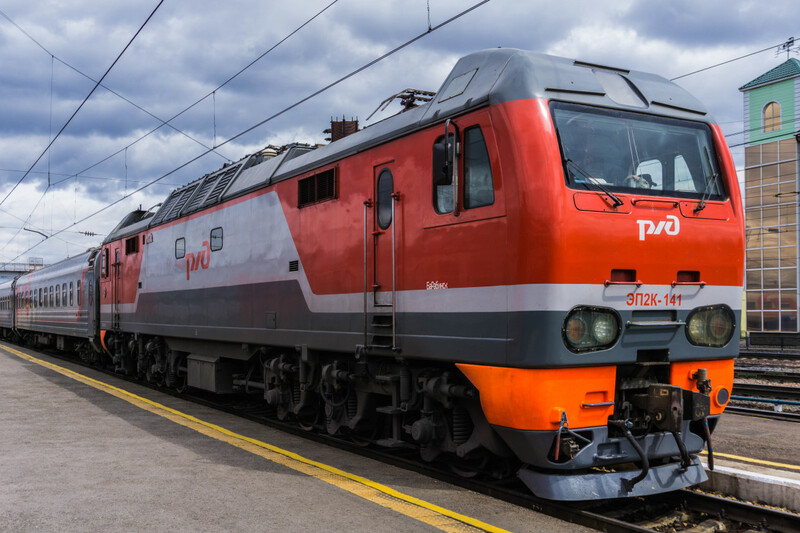 The resulting collision killed the conductor of the derailed train, and seriously hurt several passengers: 30 people on the trains suffered some kind of injury. The signalman at Settle Junction signal box was informed of the accident by the conductor of the 2H92 service and the emergency services were then alerted. 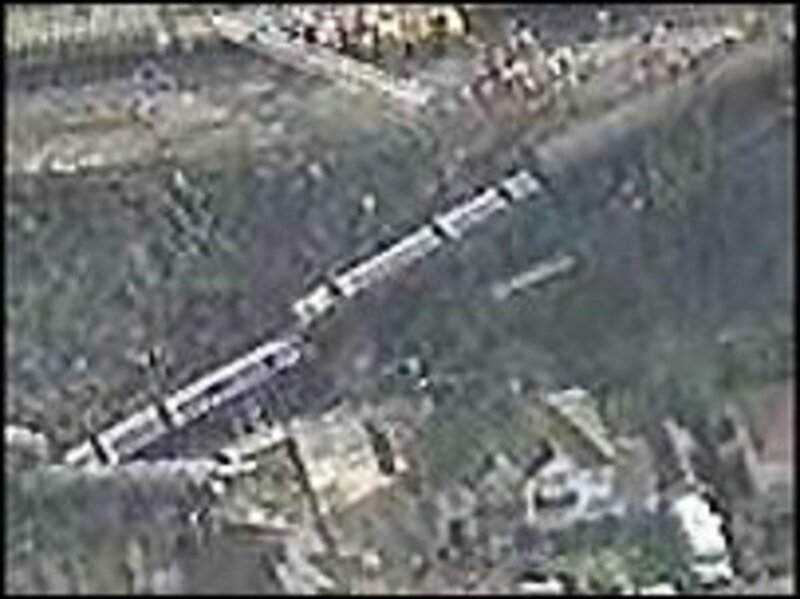 The Cowden rail crash occurred on 15October 1994, around 350 metres southeast of CowdenStation in the English county of Kent. There was a head-oncollision between two trains in heavy fog after the driver of a northbound train ran past a red signal and entered a singleline section. Five people were killed and thirteen were injured. The guard of the northbound train, who had ambitions to become a driver, was in the driver's cab at the time of the collision, in defiance of the regulations. It is thought that his presence may have contributed to the accident and there were even suspicions that he may have been at the controls. This will never be known, however, as he and both drivers were killed in the collision, and the front ends of both trains were so badly damaged that it was not possible to ascertain the positions of the crew in the northbound train. Two passengers, a couple travelling in the leading coach of the northbound train, were also killed. 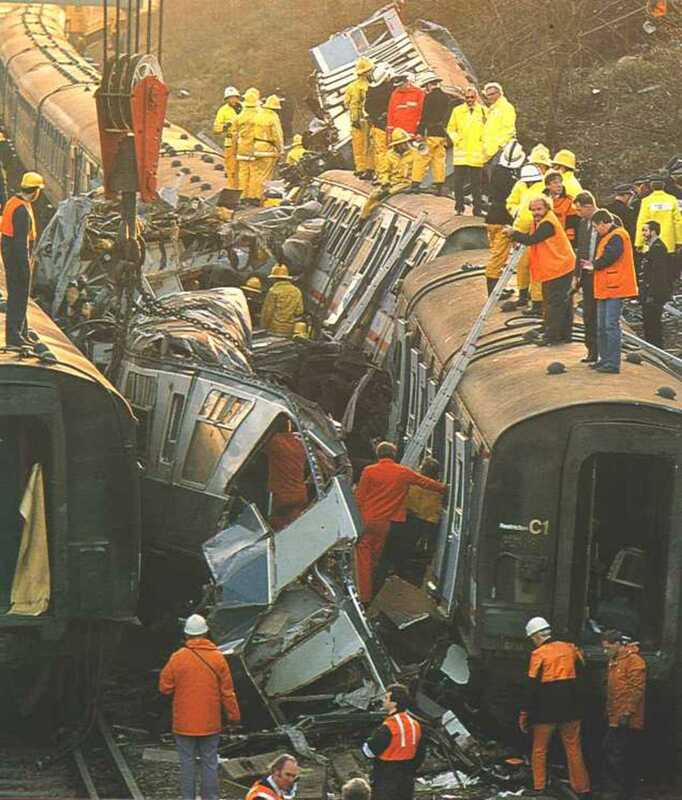 The SevernTunnelrailaccident occurred on 7 December 1991 when the 08:30 London Paddington to Cardiff Central HST was stopped at a signal guarding the entrance to the Severn Tunnel. On telephoning the signalman, the driver was advised of a signal failure and given permission to proceed at caution. Three miles into the tunnel, the train was struck in the rear by a Class 155 Super-Sprinter travelling from Portsmouth to Cardiff. 185 passengers were injured, including five seriously, but none fatally. Because track circuits were unreliable in the exceptionally damp tunnel environment 10 to 20 million gallons of water are pumped out per day, axle counters were used instead. The official report into the accident could not reach a firm conclusion, but speculated that the cause was either, an unaccountable error on the part of the Sprinter driver, or technicians in the relay room at Severn Tunnel Junction had reset the axle counter while investigating the earlier fault, thus clearing the signal for the Sprinter. A train driver was killed and 36 injured at Stafford station in a two-train crash. The 23:36 empty coaching stock train from Stoke-on-Trent to Birmingham Soho Depot ran into the rear of the 22:18 express passenger train from ManchesterPiccadilly to Penzance, which was standing in platform 4 at Staffordstation. The empty train had been given permission to pass a signal at 'danger' and draw up behind the express in order to clear the way for another train.The driver of the empty train, who was the only fatality, was considered not to have kept a good lookout. This was possibly compounded by excessive working hours and by the alcohol that was subsequently found in his bloodstream. The driver missed a warning signal in advance so that there was insufficient time to stop when he saw the red signal. He would have received an AWS warning, but the audible warning was the same for double yellow, yellow and red signals. As a result, on these busy lines, drivers are constantly cancelling AWS warnings and it becomes routine habit. 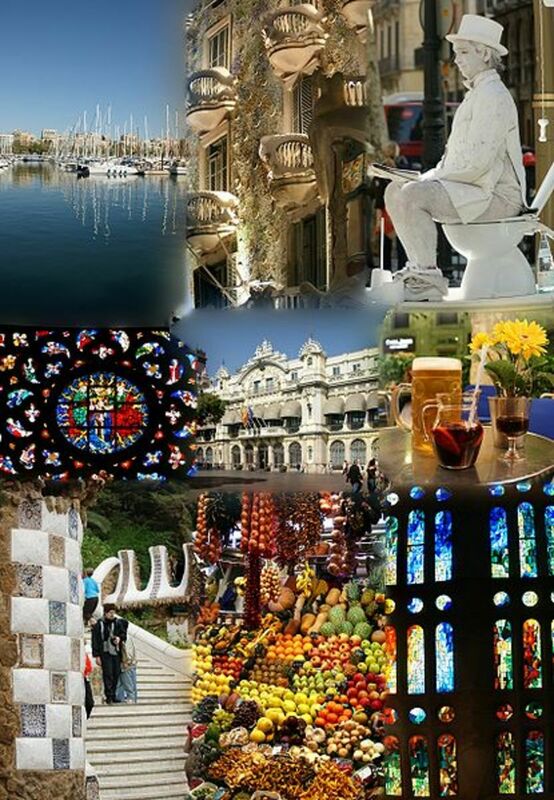 The problem had been recognised for many years but no technical solution had been found at reasonable cost. The first collision occurred after the driver of the 07:18 from Basingstoke to Waterloo saw a signal in front of him abruptly change from green to red. As required, the driver stopped his train at the next signal post telephone to report to the signalman at Clapham Junction 'A' signal box that his train had passed a red signal. He was advised there was no fault and that he was free to proceed. The driver told the signalman that he intended to make a formal report when he reached Waterloo. As the driver hung up the phone his train was hit from behind at a speed of about 40 mph (65 km/h) by the late-running 06:14 from Poole, running under false 'proceed' signals. A second side-on collision consequent on the first involved the second, third and fourth coaches of an empty train leaving Clapham Junction being hit by the wreckage of the Poole train, causing derailment and separation from the first carriage. A fourth train approaching also under false clear signals at the time managed to stop about 70 yd (60 m) clear of the rear of the Poole train. Pupils from the adjacent EmanuelSchool were first on the scene of the disaster and helped save the lives of many. They were commended for their service by the Prime Minister, Margaret Thatcher. A train driver was killed and 18 passengers hurt when a commuter train ploughed into a bridge after leaving the tracks at St. Helens, Merseyside. "When the train arrived at St Helens Central Station, a number of passengers alighted and several more joined and the train departed on time at 23.15. As it reached the point where the Up Goods line intersects the Down Main line, the leading bogie became derailed to the left causing the driving cab to strike the bridge abutment, crushing the driver as. While carrying out his ticket collecting duties, [the senior railman] had noted sparks from beneath the train before he heard the noise of the impact with the bridge. All the passengers who were injured were travelling in the leading car and several went forward to try to help the driver before they left the train. As the 09.33 Bridlington to Hull train travelling at about 50 mile/h closely approached the crossing, which is of the type known as an Automatic Open Crossing Remotely monitored , at which trains initiate the steady yellow and twin red flashing road traffic-light signals, the van was driven onto the crossing against the red lights. The left hand buffer of the train (in the direction of travel) struck the near side of the van behind the passenger seat and as the left hand lifeguard and leading wheel ran into the floor of the van it was ripped into five pieces and slewed to the left. 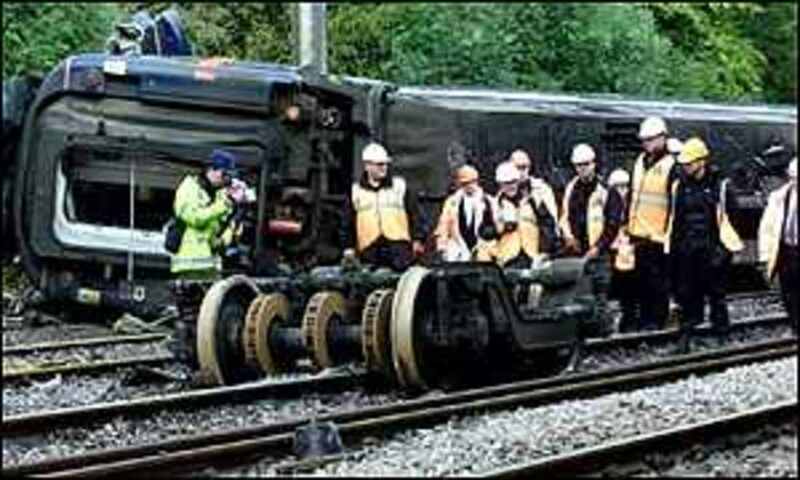 The left hand leading wheel of the train attempted to run up over the van's axle and both leading wheels of the train were derailed to the left as they departed from the crossing. Derailment was then progressive as the wheels ran down to the left of the embankment on which the line runs. 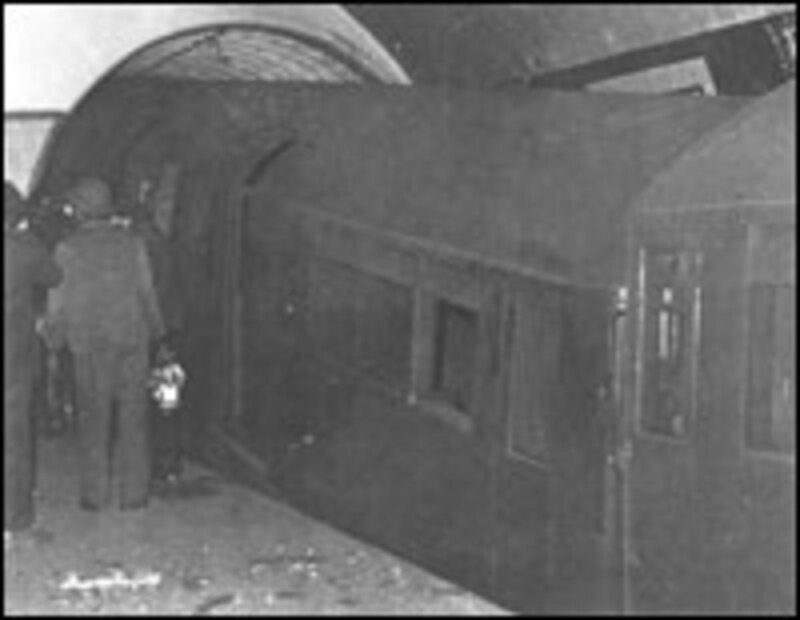 The leading coach jack-knifed, turned on its side, and was dragged along backwards with the leading end of the second coach being forced over the adjacent track. 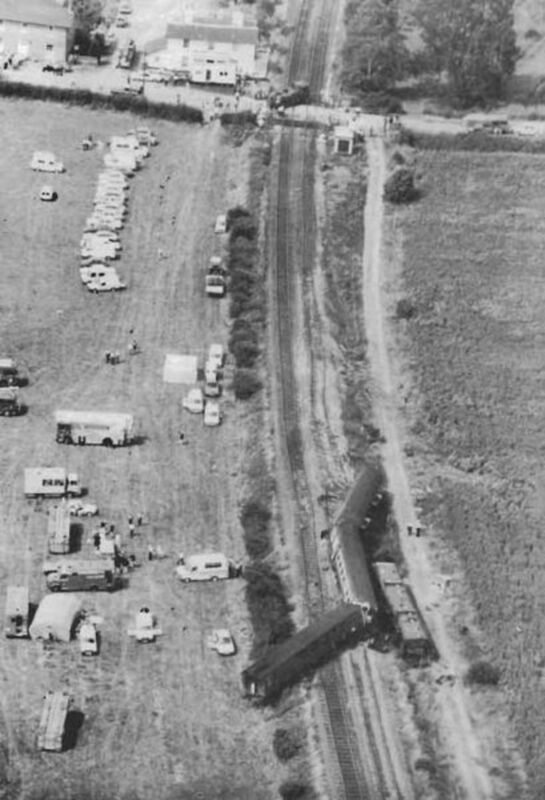 The two following coaches were both derailed but remained upright. The 08:44 passenger service from Glasgow Queen Street to Dundee, despite running late and experiencing technical difficulties, left Invergowrie station without incident. However, the brake on the leading bogie of the Class 25 locomotive was binding, although the driver carried on as Dundee was only a few miles away. As the train was running along InvergowrieBay a traction motor caught fire and the train (with five carriages) was stopped. 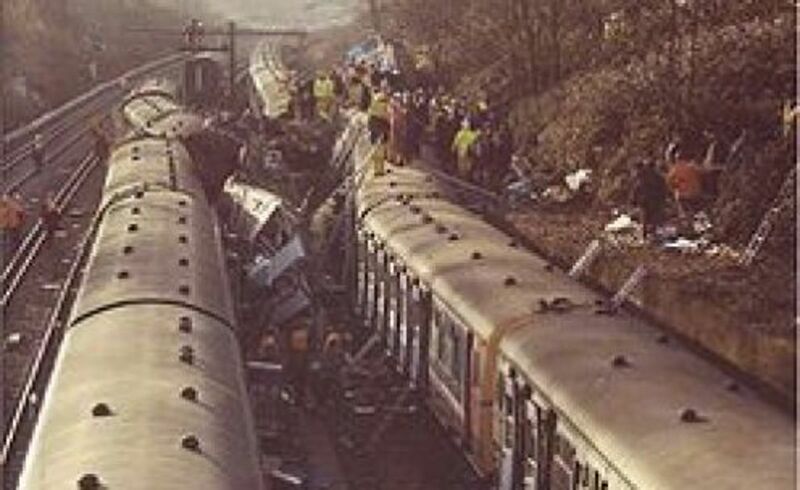 The Moorgate tube crash was a railway disaster on the London Underground, which occurred at 8:46am on 28 February 1975. The accident occurred at approximately 01.55, as the train approached Nuneaton station. The train was running over an hour late owing to a locomotive failure further south, and was composed of two Class 86 electric locomotives (nos. 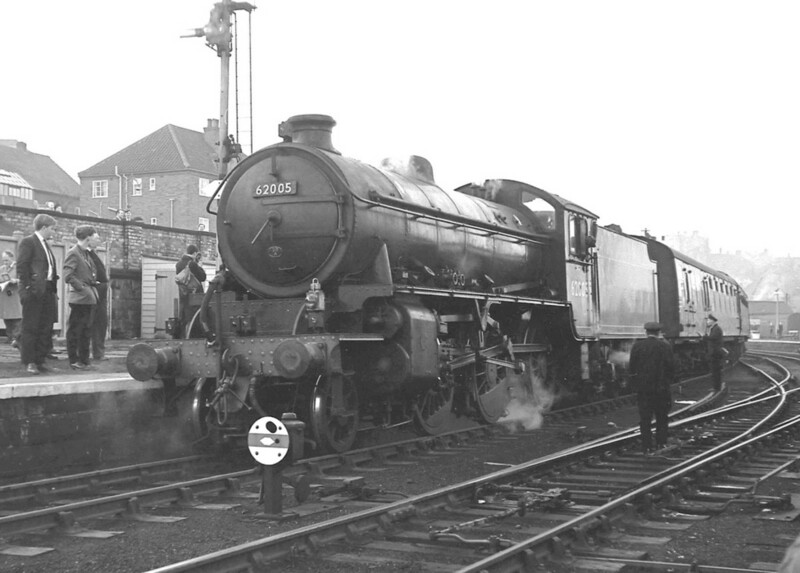 86006 and 86242; both later repaired) and fifteen carriages, including twelve sleeping cars. Just south of Nuneaton station, there was a speed restriction of 20mph for a distance of just over a mile, owing to a track remodelling scheme. Approximately a mile before the restriction, there was a board giving advance warning of the restriction. This board should have been illuminated, but was not. The driver claimed that he wrongly assumed that this meant the restriction had been lifted, and so did not slow the train. The board marking the actual start of the restriction, however, was lit, but by the time the driver saw this, it was too late. On a dark, fine, night, with good visibility, and running under clear colour light signals, the driver had relaxed his customary concentration and had allowed his mind to he distracted for a short time while his train was closely approaching Morpeth at the full line speed of 80 mph. As a result of this distraction he failed to brake the train in time to enter the Morpeth Curve, the speed round which is restricted to 40 mph, at that greatly reduced speed and the train entered the curve over twice as fast as it should have done. He was brought to his senses just after the train entered the curve and he at once braked it heavily, but the vehicle first in rear of the locomotive, a bogie brake van, derailed to the outside of the curve as it was on the point of overturning, and the rest of the train followed it into derailment and came to a stand in five parts and with most of its coaches very badly damaged. The accident was found to be due to a broken rail. At a rail joint, a fatigue crack through the first bolt hole in the running-on rail had progressively developed and a triangular piece of rail had broken out. It is probable that several previous trains had successfully negotiated the gap. The track in general was heavily trafficked by a dense outer suburban service of multiple unit trains, all of them with nose-suspended traction motors imposing high impact forces on any imperfection in the running surface of the rails. The running-off sleeper at the joint had previously failed and been replaced with a shallower timber replacement, and the replacement had not been well packed. The running-on rail was supported on an undisturbed concrete sleeper, giving a very rigid support, so that successive trains dipped into, and then struck, the running-on rail end, stressing it severely. The cyclical stress promoted growth of the fatigue crack. 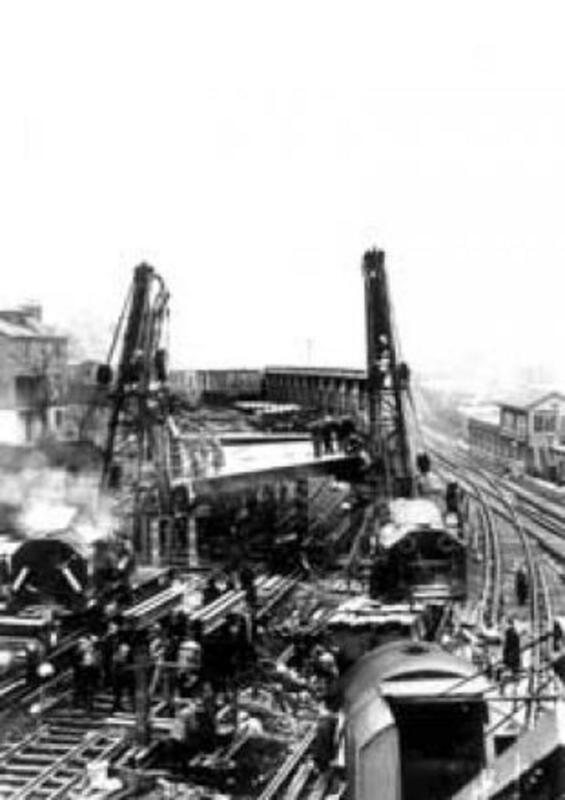 The train which actually derailed was fitted with a special suspension to limit sway of the bodies due to tight clearances on tunnels on its route on the Tonbridge–Hastings line, and this caused very high wheel forces at track irregularities; this may be the reason why this particular train (rather than the trains immediately previous) derailed. The speed limit had been raised from 75 mph to 90 mph in July 1967, and viewed in retrospect it is clear that resources for basic track maintenance were overwhelmed. 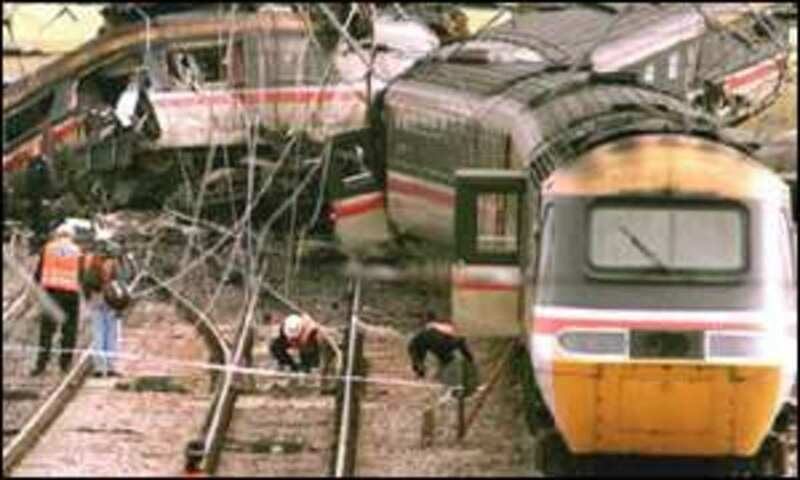 The crash, which took place at 08.19, was a double collision involving three trains. 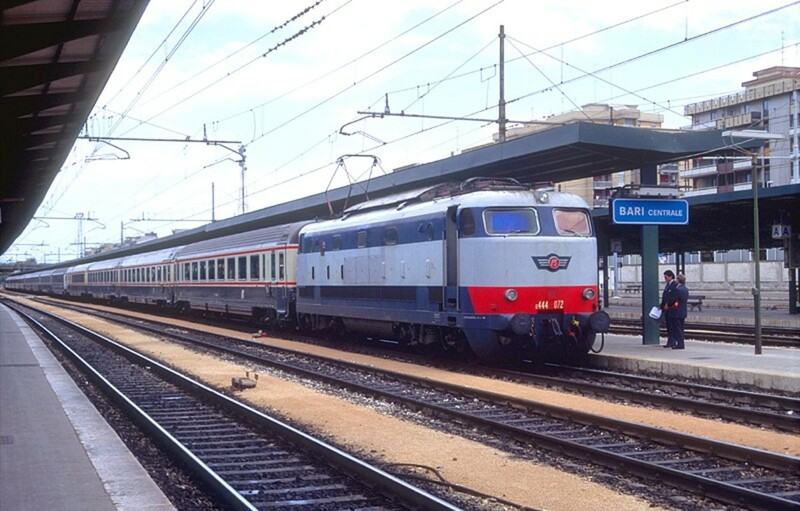 The 07.31 local passenger train from Tring to Euston station, London was standing at the up main platform of Harrow & Wealdstone station when it was hit in the rear at 50–60 mph by the 20.15 express sleeper train from Perth, Scotland. 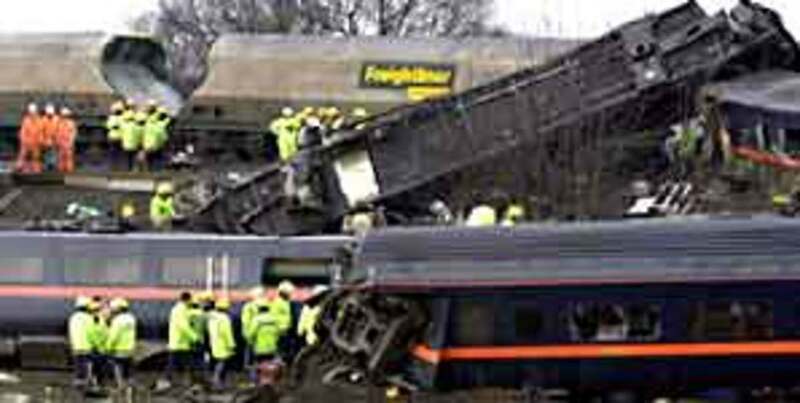 Seconds after the first collision, the double-headed 08.00 express from London Euston to Liverpool and Manchester, which was traveling at about 50 miles per hour (80 km/h), ran into the wreckage strewn across the down main line. Its locomotives were deflected to the left, ploughed across the down fast platform and came to rest across the electrified local lines opposite. 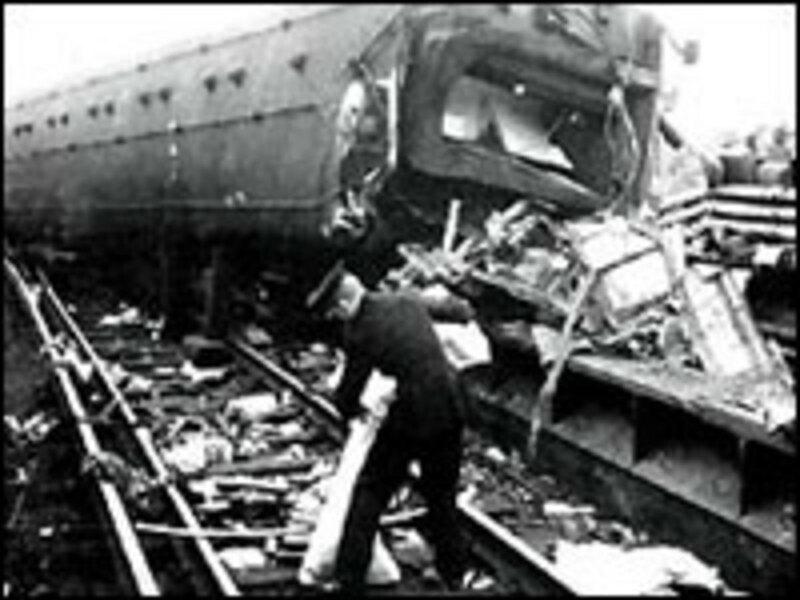 Its carriages, which overran the wreckage from the first collision, brought down part of the station footbridge. All six lines through the station were blocked by the collision. 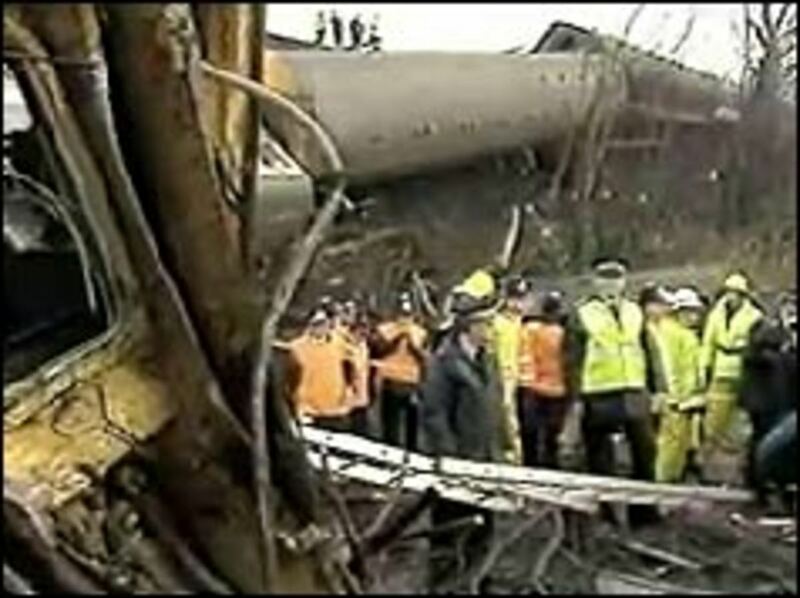 Rescue work took several days, as survivors had to be extricated from the piled-up wreckage of three trains. 112 people died and 340 were injured in the accident. The dead included 108 passengers (including 39 railway employees en route to their jobs) and four on-duty railwaymen. 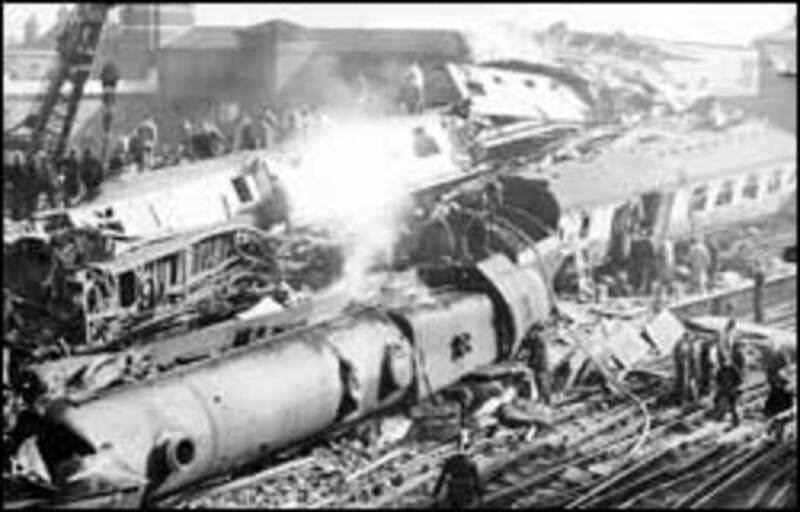 The first collision was attributed to the Perth express passing a colour light distant railway signal at "caution" and the outer and inner semaphore home signals at "danger". 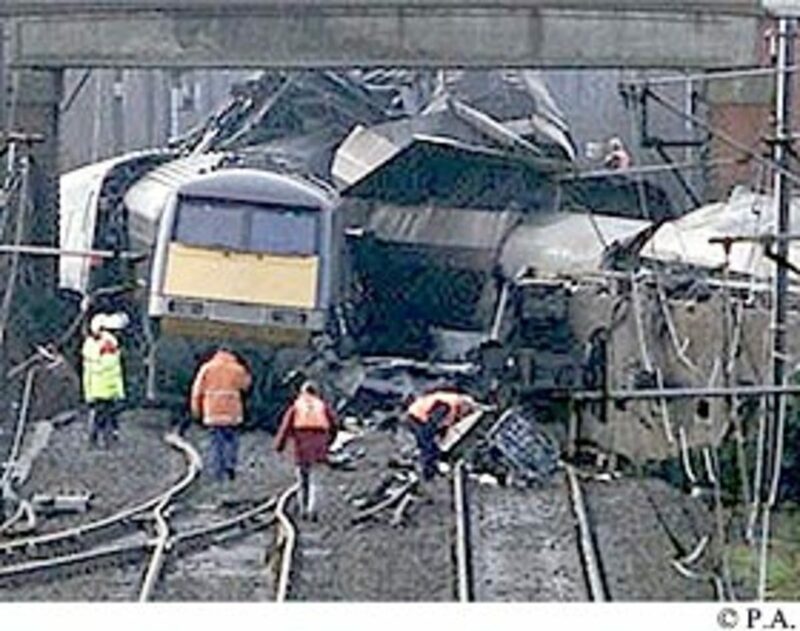 The reason for this error is unknown, as the driver and fireman of the Perth express were killed. 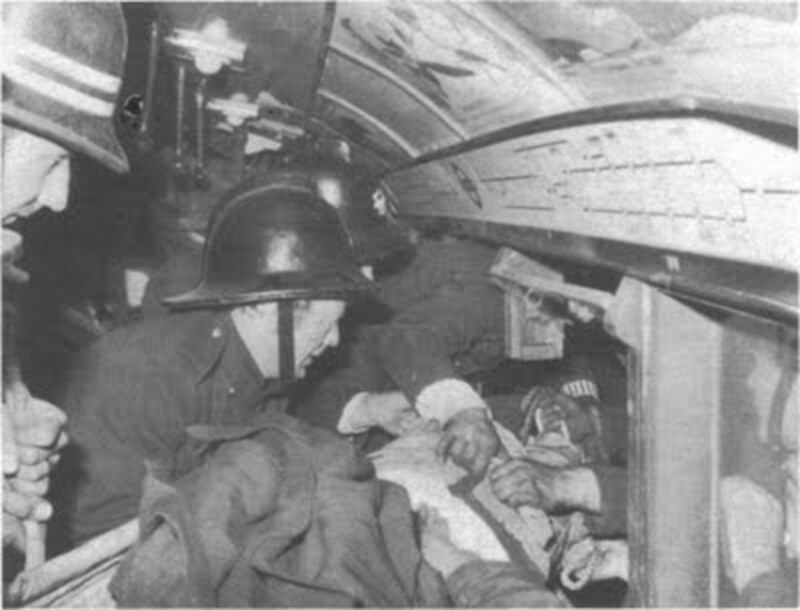 The crewmen on the down express were unable to avoid the second collision. 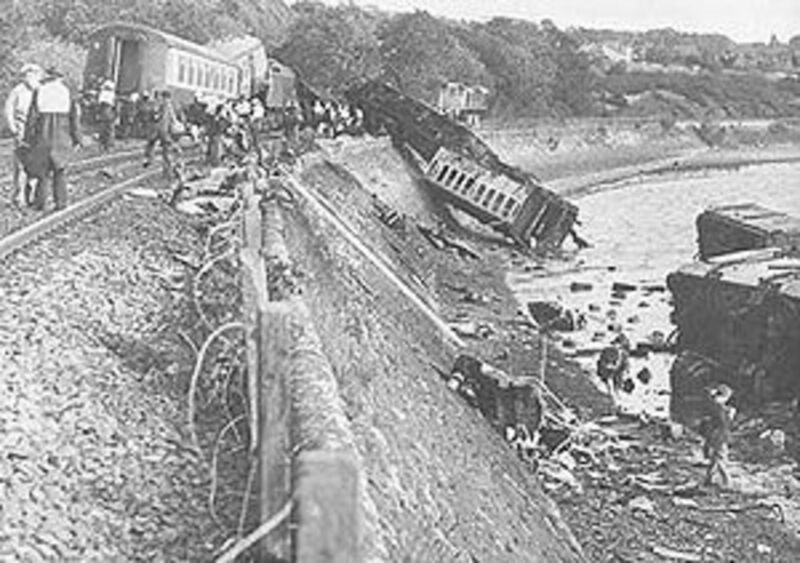 Double collision between passenger trains at Quintinshill, by which 224 passengers and three servants were killed, and 242 passengers and four servants injured. 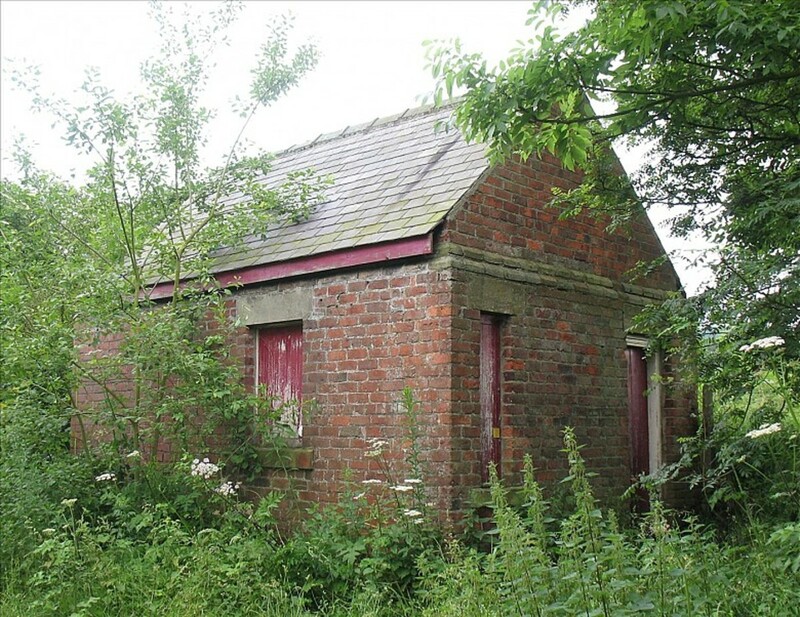 This collision was found to be due to neglect of rules on the part of two signalmen at the Quintinshill signalbox. This disastrous collision was thus due to want of discipline on the part of the signalmen, first by changing duty at an unauthorised hour, which caused Tinsley to be preoccupied in writing up the Train Register Book, and so diverted his attention from his proper work; secondly by Meakin handing over the duty in a very lax manner; and, thirdly, by both signalmen neglecting to carry out various rules specially framed for preventing accidents due to forgetfulness on the part of signalmen. This stands as the worst accident in British railway history. A very good book has been written about Quintinshill. Both signalmen you have mentioned went to prison in 1915. @Brownlickie: Thanks a lot for reading and dropping these encouraging words. About adding this as a link to your writing, you will always have an option to add hyperlinks, or make hyperlinks. That should help you do that.